LEON KELLY: DraftsmanExtraordinaire is the first exhibition devoted to the drawings of Leon Kelly held in nearly seventy years. They were last shown at the Julien Levy Gallery in New York in 1945, which included primarily drawings executed in a Surrealist style. The works were declared by the press to be exemplary in skill and draftsmanship, for there could be no question that Kelly was possessed of a staggering, natural talent. This was especially evident in his Surrealist drawings, where the confidence of his line could make fantasy take on the appearance of reality, but also in earlier works that ranged in style from Cubism and Synchromism, to various European artists whose styles he openly emulated, from Cézanne to Picasso. 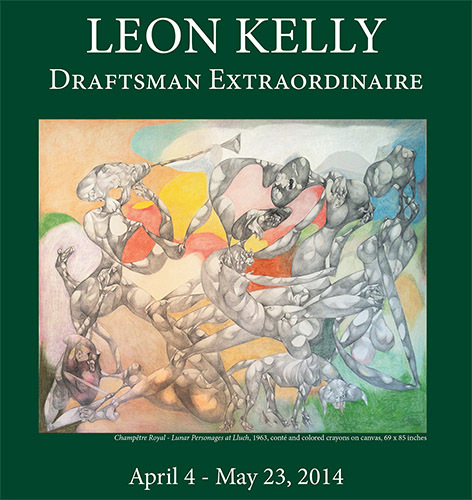 This is the second exhibition of works by Leon Kelly held at Francis M. Naumann Fine Art. The first, Leon Kelly: An American Surrealist, was held in 2008, and was accompanied by a major catalogue written by the noted scholar of American Surrealism, Martica Sawin. The present exhibition consists of fifty drawings by Leon Kelly, ranging in date from 1920 through 1969, and it is accompanied by a modest catalogue with an introduction by Francis M. Naumann that reproduces all of the drawing included in the exhibition. In Memoir of an Art Gallery (1977), Julien Levy discussed the various artists he had shown, lamenting the fact that Kelly had not achieved greater recognition and critical acclaim. The goal of the present exhibition is to help correct that error of history, for Kelly’s extraordinary skills as a draftsman put to the service of Surrealism are in themselves sufficient to secure the honored place in the history of twentieth-century art that the artist well deserves.